Before Frank Gehry and Rem Koolhaas developed a new architectural language, there was John Lautner, who apprenticed with Frank Lloyd Wright. He arrived in Los Angeles in 1938 and practiced here until his death in 1994 at the age of 83. Like R.M. Schindler, another protege of Wright, he struggled all his life to win recognition and realize his vision. In his early years Lautner designed the eye-catching Googie's on the Sunset Strip, among other coffee shops, but his prime focus was always the house. And what houses they are. Each is one of a kind, and several have achieved iconic status, including the Wolff House. Lautner never repeated himself, though his signature is unmistakable. He engineered the Wolff House on what was considered an unbuildable hillside lot above the Sunset Strip, challenging the building department to accept his daring spans, sixteen-foot high walls of glass and a cantilevered pool with it's tip turned up towards the heavens. The Wolff House is a modernist treasure in wood, stone, and glass. The house sits on a private cul-de-sac and has jet-liner city and ocean views. Stone walls sixteen-foot high were used to create the feeling of solidity, privacy and permanence. For aesthetic and practical reasons, the walls are angled at forty-five degrees, making them self-supporting in case of earthquakes. Sixteen-foot high frame-less glass doors open up to a balcony and stunning views. A simple copper roof is floated on the stone walls, with a large cantilever over the main two-story living room space. A few years after completion of the house, Marco Wolff bought the adjoining lot and, again, hired Lautner to design and build the two-story guest house. "Since Wolff was specifically seeking out the feeling of a Frank Lloyd Wright house, I came closer to Wright's architecture here than with any other house. 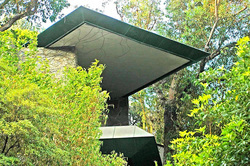 Creating a warm, solid, human, permanent environment for him was a pleasure all the way", Lautner said of the Wolff House. One of the most important and influential architects of the twentieth century, Lautner combined progressive technology with compassionate design and dramatic space-age flair. He was intrigued by man’s relationship with nature and the universe. In all of his projects, Lautner pushed the limits of engineering and technology. Other modern architects looked to Europe and the recent past for inspiration; he gazed into the future and into the vibrant present of our dynamic city. He caught the adventurous spirit of Wright without compromising his design principles. His vision was clear and idealistic. His architecture is known for its radical innovation with specific attention to materials, volume and a perpetual awareness of the natural surroundings.